>Get the most out of a wooden pillow and discover many uses you couldn’t have imagined on your own with this comprehensive, illustrated guide. It’s step-by-step instructions for various exercises make it easy to use the wooden pillow on different parts of your body. Includes exercises for specific health issues and morning and evening exercise flows. 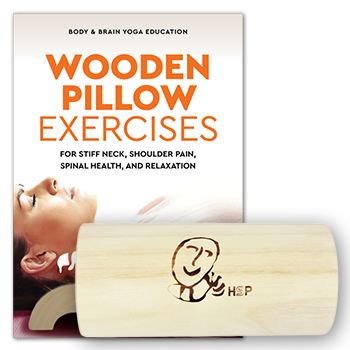 Use Wooden Pillow Exercises for Stiff Neck, Shoulder Pain, Spinal Health, and Relaxation as a health manual for all the aches and pains of life. 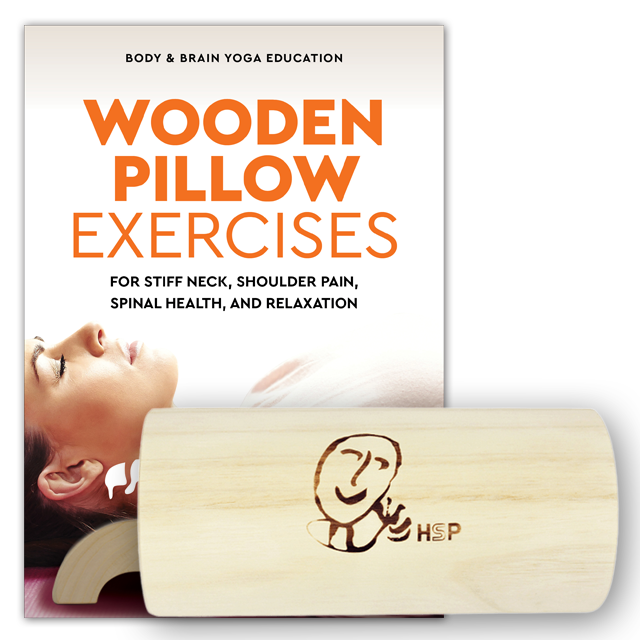 When you buy Wooden Pillow Exercises, you will find a coupon for 40% off Change Your Energy’s course, The Wooden Pillow: Head-To-Toe Massage & Healing. Helping you effectively target the body’s energy points and energy channels, the Wooden Pillow can relieve tension from the places in the body that most commonly hold stress. 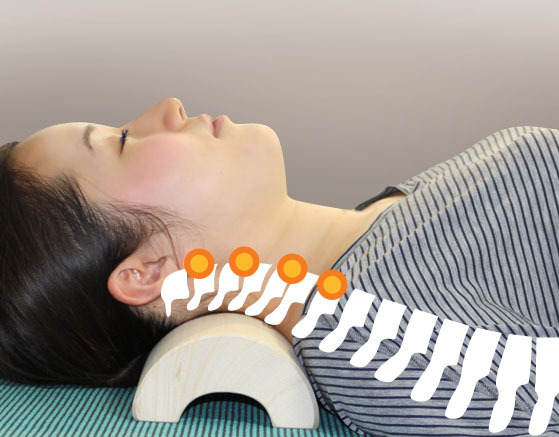 The neck and the back of the head are the first areas to tense up when we’re under stress. Placing the Wooden Pillow under your neck and gently rocking your head back and forth on the pillow relaxes the muscles and allows your cervical vertebrae to come back into proper alignment. Too much stress held in the body can lead to nights spent tossing and turning. Using our Wooden pillow is a good way to release stress and improve sleep. With regular use, it can reverse chronic insomnia and help to increase time spent in deep, restorative sleep. Many people have poor digestion and abdominal circulation because of the tension held in the abdomen. 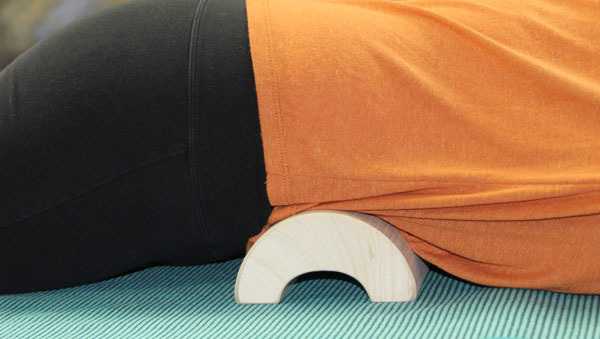 The Wooden Pillow can be used as a core relaxation technique to release tension from deep within the abdomen and improve blood and energy circulation. Since the key energy center of the body is in the abdomen, you will also find that this increases your sense of vitality and balances your mood. 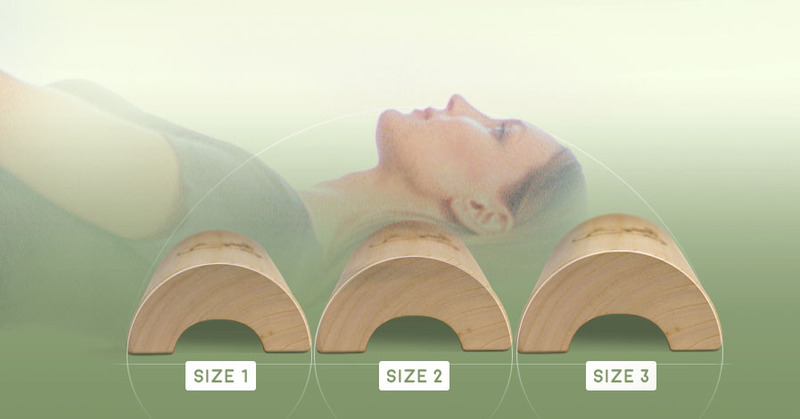 The Wooden Pillow is designed to support any person's full weight, so you can stand on the pillow in various positions to deeply stimulate and massage the foot. The foot is connected to all of your organs and body parts, so using the pillow for a foot massage is the next best thing to a full-body massage! The Wooden Pillow has the same principles as acupuncture and acupressure massage, which have been used to heal the body for thousands ofyears. 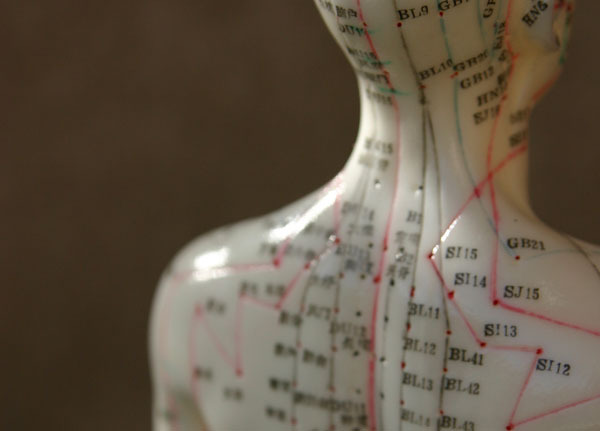 According to these practices, pain and illness result from blockages in the body’s energetic system. The Wooden Pillow helps to release blockages and stimulates energy flow along your neck and shoulders. Made of an unusual wood called Paulownia, which is known for its strong but lightweight durability, the Wooden Pillow withstands decades of use, and it is small and light enough to bring on-the-go. The pillow is expertly handcrafted in South Korea and preserves the wood’s natural, silky smooth feel. The Wooden Pillow is available in three sizes. If you are shorter than 5'3", choose size 1. If you are between 5’3” and 5’11”, size 2 is likely to be best for you. However, if you are closer to 5’3”, and have a short neck and/or tend to be thin, you may be more comfortable with size 1. If you are closer to 5’11”, have a long neck and/or tend to have muscle or fat padding your neck or shoulders, you may be more comfortable with size 3. If you are 6' or more, choose size 3. Place the Wooden Pillow flat on the floor. For more comfort, you can place a towel over it or use the Wooden Pillow Cover. Lie down, place the Wooden Pillow under your neck and very gently rock your head side to side. Open your mouth slightly as you breathe out. Focus on relaxing the muscles in your neck. As you become more comfortable and you feel your muscles begin to relax, move the pillow higher on your head, above the hairline behind your neck. Begin with a few minutes a day, and then increase the time up to 20 minutes as you become comfortable. Lower Abdomen: Lie on your stomach and place the Wooden Pillow below your belly button, above your hip bones. Breathe in, and as you breathe out, gently press in the Wooden Pillow with your abdominal muscles to release tension. Pump your abdominal muscles in and out as you apply gentle pressure. Upper/Mid-Abdomen: Stimulate the middle abdomen by following the horizontal line along the belly button. For the upper abdomen, put the Wooden Pillow right below the ribs and push in and out with breath to release tension and stagnant energy. Deeper Abdomen: Lie down on your stomach, and place the Wooden Pillow right above the hip joints. Stimulate your lower and upper abdomen by rocking your pelvis side to side. Push out with your abdominal muscles as you breathe in, and relax as your breathe out, letting the Wooden Pillow stimulate into deep blockages held your abdomen. Wear socks or place a towel over your wooden pillow. Step on the pillow to stimulate the energy points on your feet. You can do this behind a chair, at the kitchen counter or somewhere that you will be able to hold on for balance and support. For deeper stimulation, press one foot into the corner of the pillow. 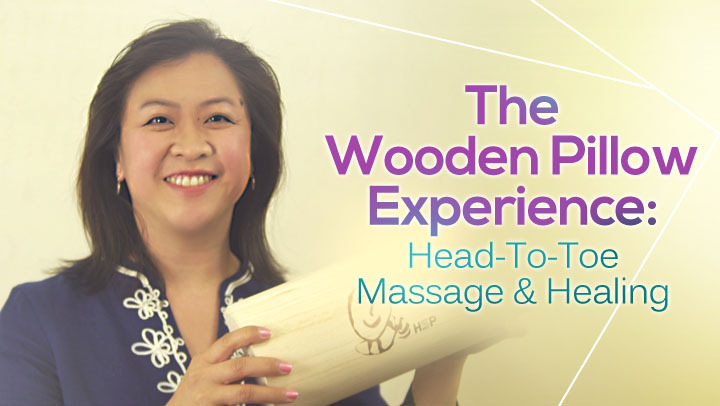 Try the Wooden Pillow Experience online course and see 27 experiential, guided videos on how to use the Wooden pillow for head-to-toe healing with acupressure specialist, Donna Lovong as your talented and compassionate instructor. Our wooden pillow is a carefully crafted self-massage tool that helps you get fast relief of pain and tension in your body. Learn all the ins and outs of using a wooden pillow with the accompanying comprehensive illustrated guide. Size 1(small): less than 5'3"
Size 2(medium): 5'3" - 5'11"
Size 3(large): more than 5'11"